News - This article was published in the June 2007 (DPC). 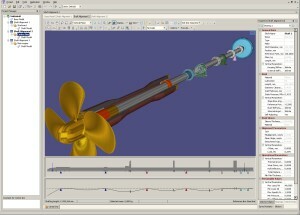 Welcome to ShaftDesigner, the innovative Computer Aided Engineering (CAE) software which is a great help for anyone involved in the design, installation, maintenance and repair of propulsion shafts. 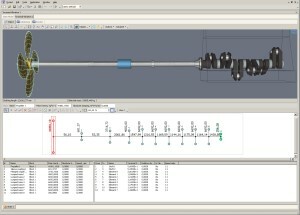 A practical user interface with easy modelling features helps create a realistic 3D representation of the shaft line, while detailed but orderly data reports provide all the information needed by the user, creating optimally functioning shafts. ShaftDesigner was developed by Dr. Yuriy Batrak of Intellectual Maritime Technologies (IMT) in the Ukraine for Machine Support B.V in the Netherlands as part of their service division in shaft alignment. It was created as a bridge between IMT's theoretical expertise and Machine Support's practical experience in the field of shaft alignment and mounting. Thanks to the software's capabilities to perform reversed calculations, the theory and practical findings could be cross-validated, guaranteeing accurate results. In the development of ShaftDesigner there was also a close cooperation with classification societies and leading OEMs of various components of the propulsion train, in order to meet their needs. The rationale of ShaftDesigner was that further development was needed in the field of alignment software. Three main problems in current software were identified. 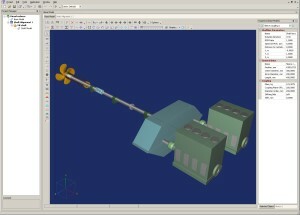 The first is the lack of a single shaft model to perform all types of shaft related calculations. 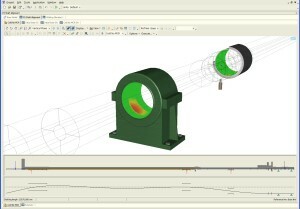 Up to now separate software with different data models for alignment and for each type of vibration has been used. The second problem is the inability to analyse different operating conditions from ballast to laden, cold and warm engine and different states from uncoupled shaft, to fully assembled propulsion trains. The user has always been forced to manage and maintain many files to achieve solutions in different states. Finally there was a substantial disparity between modern knowledge in the propulsion train domain and the capabilities of software in use. ShaftDesigner offers the solution to these issues. The software includes calculations to determine shaft alignment, whirling vibrations, bending vibrations, axial vibrations, torsional vibrations as well as coupled vibrations. 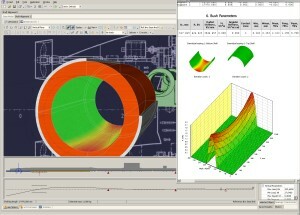 Not only is it the first time that some of these calculations are available in software, in ShaftDesigner they are all integrated in one single software package. One of ShaftDesigner's main strengths though, is the way it performs all these calculations from one single, graphically oriented base model. Once this base model has been created, any changes at any time are automatically incorporated in all applications and can be checked visually with the 3D representation, minimizing the chance of human entry errors. Also, in ShaftDesigner it is possible to model propulsion trains containing multiple shaft lines, engines, gearboxes and other components. ShaftDesigner is a useful application in all phases of a ship's life cycle, from design and construction, to maintenance and repair. Because of the scope of the software, all phases have their specific benefits. An accurate representation of all components of the propulsion train, including engines, gearboxes, bearings and propellers, is created using details about each element. Because of the easy drag and drop function of ShaftDesigner, all the propulsion train components are relatively fast to place, to speed up shaft line modelling. From an engineering point of view ShaftDesigner provides a useful tool to explore offsets to optimize the position of all propulsion train components based on acceptance criteria set by the user. This is done in order to, at an early stage, guarantee a good bearing load distribution and thus safe operation of the shaft line. Because ShaftDesigner can identify this issue in the ship's design phase, possible time-consuming and costly (re-)alignment problems can be avoided. Also, at this early stage, with the various vibration modules, it is possible to calculate if a certain lay-out has the potential to create harmful vibrations and estimate possible alterations which could be necessary. 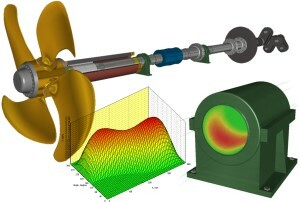 If the propulsion train was not modelled with ShaftDesigner in the design phase of the ship's construction, ship builders can reap significant benefits from modelling it before the alignment of the shaft takes place. Where designers can benefit from the fast modelling capabilities of the drag and drop function, ship builders profit from the fact that exact measurements can be easily entered into the ShaftDesigner software, automatically updating the model every time a new entry is made. 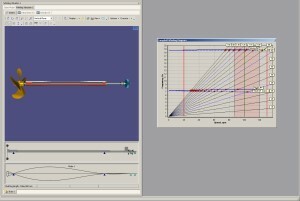 ShaftDesigner provides the data for various shaft alignment techniques including jack-load, laser alignment and strain gauge alignment which can be used at various stages of the shaft line's installation. An accurate representation of all components of the propulsion train, including engines, gearboxes, bearings and propellers, is created using details about each element. 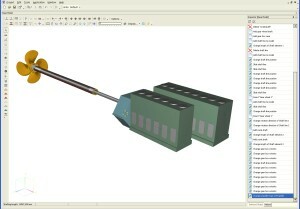 For maintenance and repair purposes creating a model of the shaft line in ShaftDesigner is a good way to start the job. By subsequently calculating the alignment and possible vibrations of the shaft, it is possible to detect issues at an early stage that could be influencing the state of the shaft line's components. Stress points of bearings can for instance be recognized and thus can be checked for wear on board, avoiding costly ship down time in case of failure. Also, using ShaftDesigner it is very easy to verify shaft alignment as condition monitoring after a ship is grounded or after another incident, and evaluate acceptability of alignment changes. The results of the various ShaftDesigner calculations are represented in detailed, but easily customizable reports, containing all information needed by the end user. To facilitate easy analysis of the reports the software automatically generates graphical outputs to support the results. Also, certain results can immediately be seen in the base model, making it easy to make preliminary conclusions at a single glance. All reports are created as a XML document so they can easily be exported to various formats, such as html, Microsoft Word or Windows Web Archive (.mht). Machine Support is a provider of chocking and mounting materials, as well as a service provider for alignment and mounting solutions for machines. This year Machine Support B.V. celebrates twenty five years experience inproviding complete solutions for the mounting and alignment of machines. At this time Machine Support's fifty people staff offer their expertise in the marine field to ship owners, operators, shipbuilders, ship repair organizations and OEM's throughout the world.